If you’ve been keeping up with all the goings on of ORCAA students this summer, you might think our lives as grad students are full of glamorous field work. I’m sorry to report that there is more to being a grad student then picturesque moments with charismatic study species in beautiful locations. We spend the majority of our time in front of a computer, and much of that time is spent writing. I used to find the idea of writing a thesis quite overwhelming, and sort of dreaded it. But writing is how we, as scientists communicate with our peers and with the public; it’s the most fundamental way we make our research mean something! So I decided I better get used to it, and get better at it ASAP. This summer I was lucky enough to spend an entire week learning about writing. 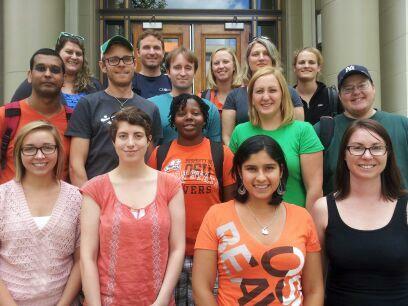 I took the special Thesis Writing class taught by Dr. Vicki Tolar Burton of the Writing Department here at OSU. This class wasn’t just about sentence structure or grammar (affect vs effect, anyone? ), but was all about figuring out how I operate as a writer and developing writing-habits and productivity tools so I can sit down to write and, well, actually write! We wrote all day for 5 days – no cell phone, no email, no errands – then met for 2 hours each evening for peer review and discussion. I was surprisingly exhausted by the end, but I finished the class with a more positive confidence about writing. I not only gained some valuable writing habits, but more importantly I learned how to try new tools and evaluate their effectiveness for me personally so I can continue to develop as a productive writer. Happy students on our last day of class. We don’t look that tired do we? My favorite part of the class was discovering my five Character Strengths and learning how I can use them to find success as a graduate student, in writing and otherwise. My top five described me perfectly, and although I first thought they seemed like weaknesses when it came to writing, by the end I was able to see how I can use them in the best way possible. You can find your own here; it’s worth registering. So after my week of writing I was ready to get back to the fun stuff (someday writing might be fun…). Some folks from Hydronalix and NOAA came out to Newport to train Holger, Alex and I to drive and care for one of ORCAA’s newest toys: the EMILY. The EMILY is a totally awesome remote-controlled boat I suspect was built just for scientists like us who aren’t ready to be adults quite yet. They are currently used by beach lifeguards as rescue buoys and there are plans to send them kamikaze-style into hurricanes to collect storm data. ORCAA has plans to tow a hydrophone behind it and listen for ultra high frequency cetaceans (eg harbor porpoise) off Newport’s coast where NNMREC tests wave energy devices. EMILY needed some modifications for the conditions here in Oregon (too much seagrass!!) but we got her up and running and only had to carry out a few rescue missions with the skiff. I’m looking forward to getting some more time with these little torpedos! These pictures may look familiar if you follow us on Twitter @ORCAAlab. Beautiful day for some remote-controlled boat driving on the OSU dock. Our fleet of EMILYs, ready to be launched. Software used to steer EMILY just where we want her. Joe and Holger bringing an EMILY in after the intake sucked up too much seagrass. Our very fancy mesh and duct tape kelp-excluder-screen. Best part is, it actually worked! ORCAA work in the news!